It’s no secret that here at A Space Ahead, we’re rather fond of cats. Whether they come in the form of a game or a lovable ball of fur, we just adore them. So when I came across a game, the sole goal of which was to collect as many cats as possible, well- I just couldn’t resist. 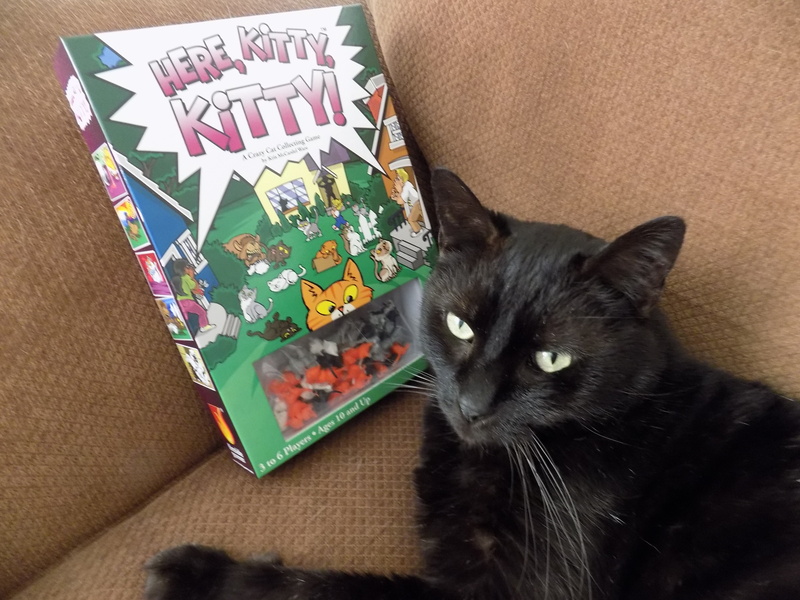 So grab your cat litter and squeaky mice, it’s time for our review of Here, Kitty, Kitty! Fresh out of the adoption agency, Here, Kitty, Kitty! is a game for 3-6 players from Fireside Games and new designer Kris McCardel Ware. 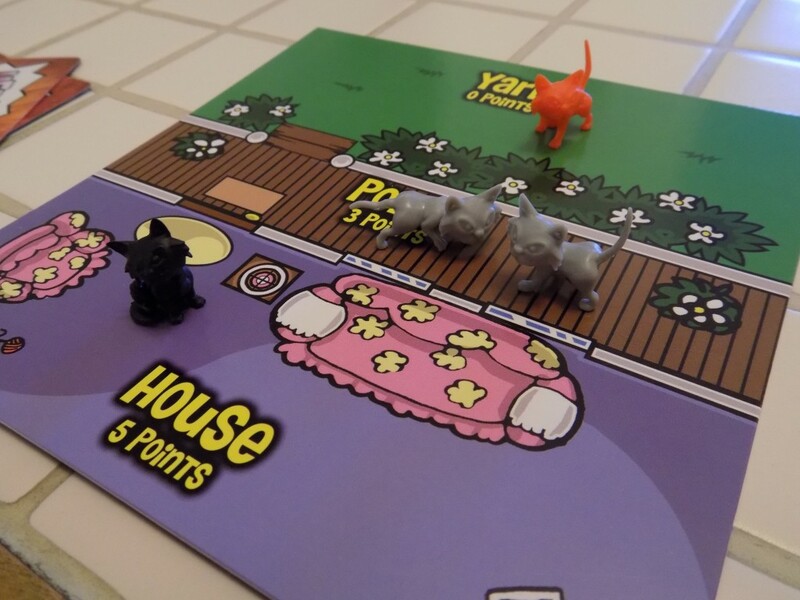 In this game, each player has their own Property (a cardboard square in front of them) which is divided into three sections: Yard, Porch, and House. 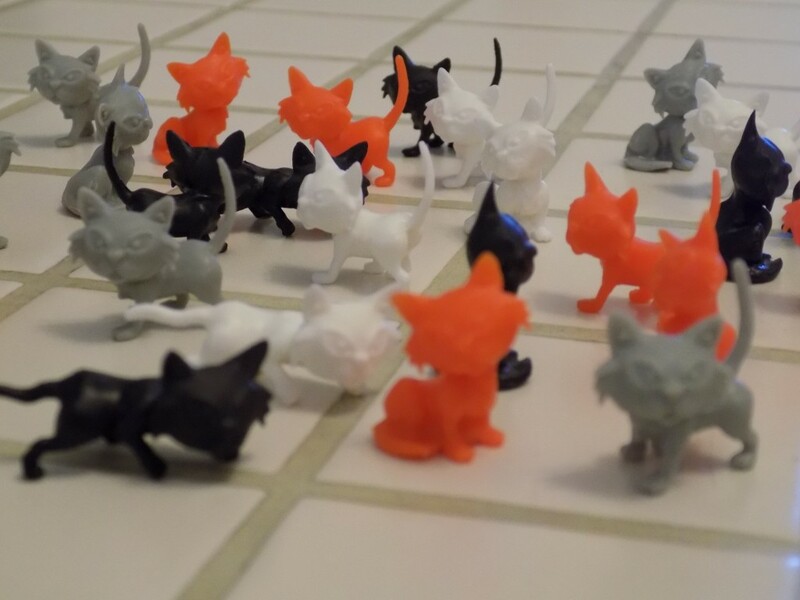 In the center of the table are forty tiny plastic cats, ten of each color (black, grey, white, and orange). This pile of plastic kitties is referred to as the Neighborhood. On a player’s turn, they may take two actions, which may be any combination of moving a cat (either from the Neighborhood into their yard, or if already on their property, one section closer to their House) or the other option is that they may play a card from their hand. As I said, they may do two actions, so they can either move a cat twice, or play two cards, or do one of each. 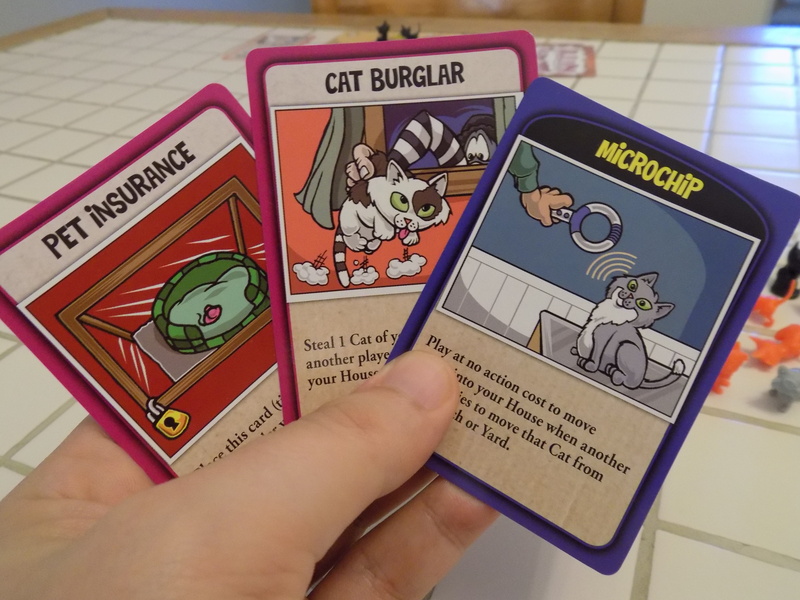 Cards do any number of things, from moving cats from the Neighborhood into a player’s Property or House, stealing cats from other players, forcing players to return cats to the Neighborhood, or even stopping another player from doing any of these actions. Seems pretty straightforward, right? Well, at the end of a player’s turn, they must draw back up to the hand limit. If one of those cards is a red Instant card, the effect takes place immediately, and almost always with disastrous results to every player’s cat collection. Here, Kitty, Kitty! nails one of the most important aspects of board games- tactile-ability. There is nothing quite so satisfying as picking up one of these small cats and placing it in your Yard, or moving it from your Yard to your Porch, or even moving it from your Porch to your House. What’s more, these little cats come in three different poses, so the odds are that each time you reach for one, it will feel different between your fingers. Is this game simple? Sure, but it also is fun to play and fun to fiddle with during someone else’s turn. What’s more, while there is player interaction, it doesn’t take on a vindictive quality, which makes this a great choice for people newer to the hobby and younger gamers. The art style on the cards is fun and stylized- the list goes on for why this game is -ahem- the cat’s pajamas. Here, Kitty, Kitty! 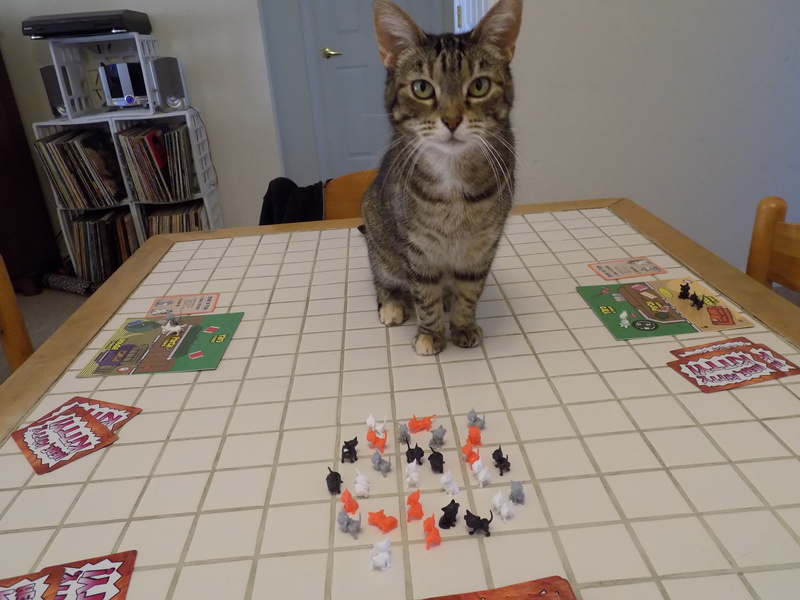 is is a great opener for a game night and is a surefire hit with any cat people you might know. Again, it is a little simple, but while it isn’t an hour long strategic puzzle of a game, it does offer players agency and- who am I kidding? Look at those cute, little cats! Look at them! Now, if you’ll excuse me, I have a pile of hairballs and dead birds to clean up.